Within seconds of successfully releasing their Upkeep bouncing bomb, “Dinghy” Young and the crew of AJ-A ‘Apple’ are hurtling over the damaged fortress-like wall of the Möhne dam. 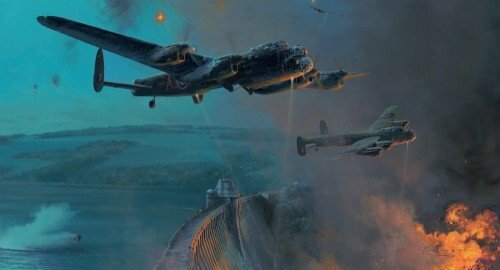 Commanding Officer Guy Gibson flying alongside noted that Young’s bomb made ‘three good bounces’ before striking the dam wall. To help commemorate the 75th Anniversary of this legendary mission, the Military Gallery is delighted that this powerful image is now part of Robert Taylor’s hugely popular series of Studio Proofs on canvas. Replicated onto fine canvas under the direct supervision of the artist, we are delighted to issue the very exclusive Exhibition Proofs – their extra-large size creates imposing centrepieces for the large wall, workplace or hangar.